"The notation on the back of the photograph identifies the scene as the 'South River Fish Runway, Montrose' and the bridge as the 'bridge on the old road, north of the present street.' The writer probably meant the Saugus River, which flowed from Lake Quannapowitt (formerly Reading Pond and the Great Pond) into the ocean. The early settlers relied on the alewives that came up the Saugus River to Reading Pond to spawn. This food supply was nearly 'destroyed' when a dam was built at the Saugus Iron Works in 1675. Although efforts to block the dam were unsuccessful, the alewives continued to make the trip up the Saugus River, becoming abundant again well into the late 1800s and early 1900s. A Fish Committee, which regulated fishing on both Lake Quannapowitt and Crystal Lake, was established by the Town in 1876 in conformance with the regulations set by the State Commission who held the lease for the lake. In 1855, the ninth annual report filed by the Fish Commitee noted that 'true to wonderful instinct with which nature endows them, the alewives made their usual pilgrimage from the ocean to the lake at the accustomed time, notwithstanding the hindrances and cruelties which were inflicted on them.' In 1889, the report noted that there was little of interest to report, although the mill owners constructed a sluiceway at Hone's Dam, causing an obstruction of the first run of the fish." - Text from calendar by Jayne M. D'Donofrio. 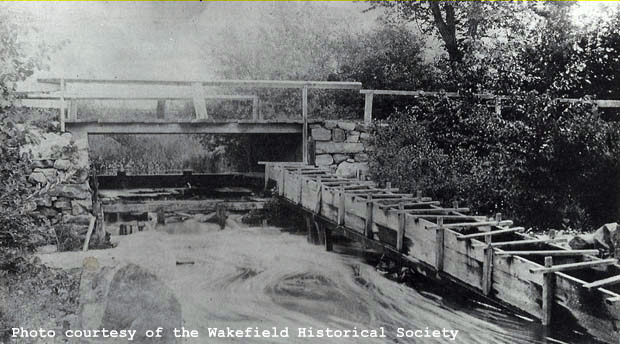 Photo courtesy of the Wakefield Historical Society. “Fish Run, Montrose, 1890,” NOBLE Digital Heritage, accessed April 20, 2019, https://digitalheritage.noblenet.org/noble/items/show/6840.